I'm not even going to bother saying how fast October went; I'm just going to say between now and the New Year I don't expect to know what happened to any of the time that flew by! Considering I blinked and October was over I actually accomplished most of my goals. I actually managed to try two new recipes this month, which you can find here and here. I wouldn't say I completed half of my Christmas shopping, but I did get a good start on it which is more than I can say for most years! Lastly, I did read two books, one of which I reviewed here. Overall it was a pretty good month. Now on to a new one! My goals this month are definitely geared more towards self-reflection and getting a jump-start on the new year! Is anyone else freaking out that it's almost a new year? 1. My first goal is to get back to my Garmin Vivofit. If you don't know what I'm talking about, the Vivofit is essentially a step tracker that also keeps track of calories and sleep. I detailed my love for it in this post, and also talked about why it's so essential to my well-being. I've gotten back into the rut of sitting for long periods during the day and I definitely need to combat that again. Putting my Vivofit back on this month will definitely help remind me to get up and walk! 2. My second goal is to try... and I emphasize the word try here...not to succumb to holiday stress. Every holiday I promise myself I will just enjoy the season and every holiday is a frenzy of last minute planning, cramming in parties and family time and just general chaos. This is inevitably likely to happen again this year, but instead of having a full on panic over it, I'm going to calmly take it all in and just enjoy it for what it is: an absolutely crazy time of year. 3. My third goal is to actually fill out and send Christmas cards. I am generally an organized person but for some reason the holidays become a complete disorganized mess for me (see above). Every year I have the intention of sending all my loved ones a holiday greeting but every year Christmas comes and goes without me even attempting to do it. Step #1: actually buying the cards. 4. 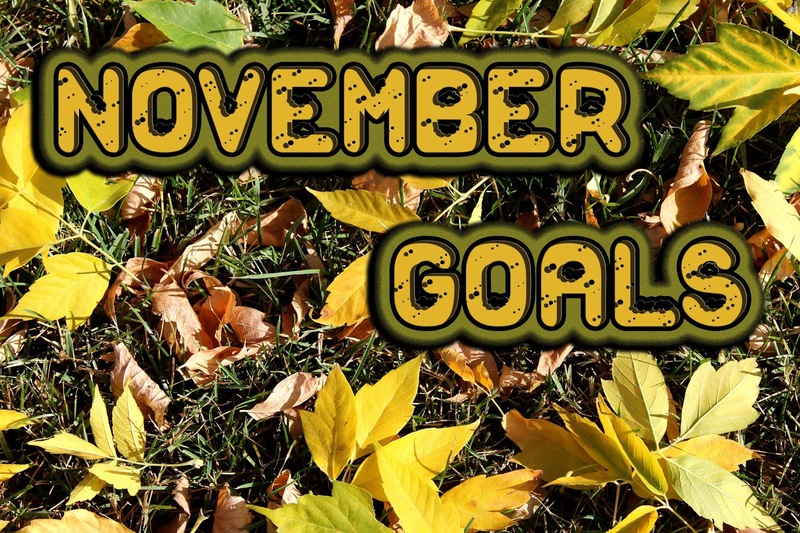 My fourth and final goal is to take a moment to breathe this month. We get so caught up in life, in completing that never ending to-do list, in trying to be everything at every moment of every day, that we never take a moment to ourselves. I often feel guilty when I sit down and have an afternoon cup of coffee because I have a laundry list of things waiting for me to get done. But so what? We all do, and as has been proven, that list will always be there, so I'm going to go ahead and have that cup of coffee when I need a moment to just breathe and I'm totally not going to feel guilty. Well...technically the goal is to just do it, the guilt part doesn't really count! Those are the things I hope to do this month. What are your goals for the holiday season? Great post Kim! I wish I was organised like you and had started my Christmas shopping. Definitely try to breath and relax this month and try not to stress beautiful. Hope you are ok and having a great week my gorgeous friend! We'll stick together: do not give in to holiday stress!!!! We can do it!! I have been trying to have a cup of tea now and then and just relax, sometimes with a cookie!!! I wear a Fitbit every single day and it definitely keeps me accountable and moving my bootie except when I'm drinking tea, lol!! I hope your Wednesday goes by smoothly my gorgeous dear!! Good luck with your goals! I need to get better at wearing my FitBit! I always forget to put it on but love it when I reach 10k steps. Great goals! The Vivofit sounds like an awesome tool especially as winter creeps in and it gets harder to get outdoors to exercise. I seriously need to do one of these monthly goal lists, although I'm afraid I wouldn't achieve anything on my list and would then just feel like a failure! I admire you for wanting to stay calm and organized for the holidays since it can be such a stressful time of year. I am also very intrigued by your Vivofit device. It sounds like a great way to stay fit and healthy, which is also something important to consider around the holiday season! Have a lovely rest of your week Kim! Great goals! It's hard not to get overwhelmed during this season. My goal is to not overdo it. I tend to make too many commitments around the holidays and burning myself out. I am going to take my time decorating and do things little by little. I am going to try and not to spend too much money on presents this year...I always buy too much. It's a lot of fun, but not for my bank account in the long run. ha! Yes, you go girl!! I really love the idea of having monthly goals and your ones are so inspiring to read! Number 4 we are so all in need to do and be reminded of this so thank you Kim! <3 I'm really looking forward to what 2016 has installed, it is pretty crazy how fast this year has gone by. My family is just having a super chilled Christmas this year with no presents and no pressure just us all hanging out for the day and having a good catch up which is really nice to have.